The Finnish Spitz, or Suomenpystykorva, is native to Karelia, which is located in both Finland and Russia. It was developed to hunt a wide variety of game, from small animals such as squirrels and birds to larger prey including bears and boars. Their main role is not to attack, but to bark out the location of the animal, which led them once being called Finnish Barking Bird Dog. When they pinpoint their prey these dogs ‘yodel’ for the hunter, a ringing succession of fast barks that can reach 160 barks per minute. They will then wave their tail back and forth hypnotically, leaving the prey immobile until the hunter dispatches it. 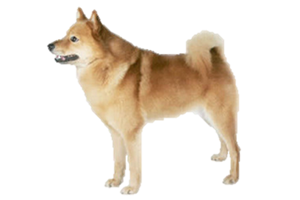 The Finnish Spitz is a breed of hunting dog from Finland, where it has been recognized as the National Dog since 1979. It is believed they began their existence in the far north of Scandinavia, their ancestors originally accompanying the Finns when they arrived in Finland. These dogs remained fairly isolated from outside humans and breeds until the late 1800s. As motorized vehicles and snowmobiles allowed access to their homeland native spitz were bred with other breeds, causing them to almost become extinct. The Finnish Spitz was saved by two men, Forest Officer Hugo Sandberg and his hunting companion Hugo Roos. They were so impressed by their hunting abilities that they established a breeding line, taking several dogs home with them. Nearly all modern dogs are descendants of this line, although some native specimens have been added at various times to strengthen the bloodline. Today the Finnish Spitz still finds work as a hunter in Finland and Sweden. However, it is just as happy at home in the role of companion and has found one in many homes around the world. Is the Finnish Spitz Right for You?